Hello all, I have some legitimate questions regarding using a chemical peel. So, first off, some background- 18, male, 155 lbs, very active bodybuilder with moderate acne/scars/red marks. I am also a fair skinned Caucasian. 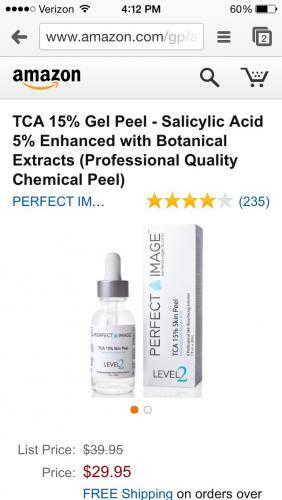 Now, I've ordered a beginner level chemical peel, containing 15% TCA gel and 5% salicylic acid from Amazon, which is meant to be used at home. I'm not concerned about it being on my face, but I have heard a great deal of controversy regarding using chemical peels on the back and chest/neck. Many say the neck is the same as the face, in terms of how the skin will respond to the peel. Is this true of false, and why or why not? Just as well, I wasn't sure whether or not it would be safe to use on my chest and back. On my back, I have some minor cystic pimples and some moderate acne as well as scarring from acne, which I hoped to remove. However, I have heard that the skin on the back is harder to treat, due to it being thicker, thus necessitating a different treatment. I don't want to bleach my skin, or cause scarring or anything, so I was hoping to get some legitimate answers, hopefully which can be sourced/referenced. Lastly, I have moderate acne/scarring on my chest, which I would also hope to treat. So, ultimately, I want to know if I can use this peels, or any peel, on my chest and back, and if so, how. I have been on 10% b.p and 2% salicylic acid for years, and I have also tried prescription medicine, although nothing has worked. I've heard good things about peels for removing scars/minor acne. Please be thorough in your answer, and I would definitely appreciate any personal experiences with body/facial peels. Thank you so much!